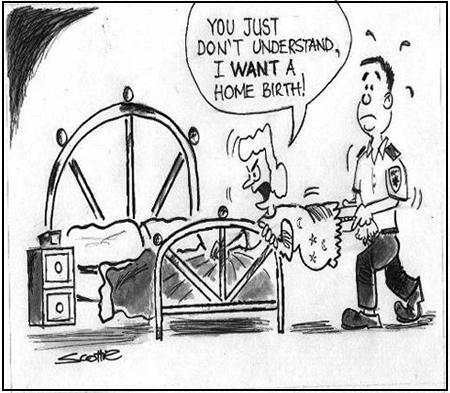 God bless him, my favourite G.P is once again goading midwives, this time those who attend homebirths, in his offering ‘Midwives and home births: the truth’. I can’t seem to discover any ‘truth’ a la Dr Crippen in this, which I find surprising as he says that this Guardian article, concerning the journalist’s recent experience of his wife’s home birth and including an interview with one of the midwives, ‘sums it all up’, and he then concludes by advising ‘make sure that there is a doctor close by when you have your baby’. I’m not sure why, or how the article supports this advice but if I take the title of Dr C’s entry at face value, then I can only conclude that the good doctor has finally decided that there is a place within the maternity services for homebirth! It will be sad to stop the debate but soon there should be a definitive answer to the question of where is the safest, best place to give birth, so then Drs C and T will either have the last say or, have to eat their words. A study, Birthplace, by The National Perinatal Epidemiology Unit is underway. The study will answer questions about wellbeing, safety and quality, women’s experience of care, the process of transfer from planned place of birth, and the cost-effectiveness of different systems for care. The study will reach it’s conclusions in 2009 so, within 18 months we should have an answer to the perennial question of how safe is home birth?